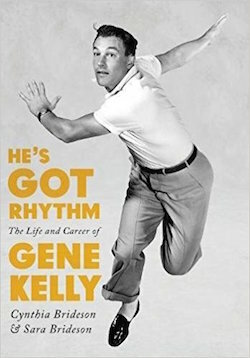 Welcome to the "He's Got Rhythm: The Life and Career of Gene Kelly"
FROM MONDAY May 29 through SATURDAY July 1 Classic Movie Hub will be giving away a total of SIX copies of He's Got Rhythm: The Life and Career of Gene Kelly by Cynthia and Sara Brideson, courtesy of University Press of Kentucky! 1) Follow @ClassicMovieHub on twitter for the contest announcements. 2) Successfully complete a qualifying entry task during the specified contest week. 3) Winner(s) will be chosen at random at the end of each specified contest week and announced on Twitter the following day. 4) One book will be given away each specified contest week during the contest period, for a total giveaway of five books within five weeks. 1) Visit us on Facebook or the CMH Blog for the contest announcement. 2) Successfully complete a qualifying entry task during the specified contest period. 3) One winner will be chosen at random at the end of the contest period and announced on Facebook and the Blog the following day. 4) One book will be given away during the contest period, for a total giveaway of one book within five weeks. PLEASE NOTE for all prizing: Only Continental United States entries are eligible. One of the most influential and respected entertainers of Hollywood's golden age, Gene Kelly revolutionized film musicals with his innovative and timeless choreography. A would-be baseball player and one-time law student, Kelly captured the nation's imagination in films such as Anchors Aweigh (1945), On the Town (1949), An American in Paris (1951), and Singin' in the Rain (1952). In the first comprehensive biography written since the legendary star's death, authors Cynthia Brideson and Sara Brideson disclose new details of Kelly's complex life. Not only do they examine his contributions to the world of entertainment in depth, but they also consider his political activities―including his opposition to the Hollywood blacklist. The authors even confront Kelly's darker side and explore his notorious competitive streak, his tendency to be a taskmaster on set, and his multiple marriages.Drawing on previously untapped articles and interviews with Kelly's wives, friends, and colleagues, Brideson and Brideson illuminate new and unexpected aspects of the actor's life and work. He's Got Rhythm is a balanced and compelling view of one of the screen's enduring legends. 1) Follow @ClassicMovieHub on twitter for further instructions. 2) Successfully complete a qualifying entry task during the contest week. TO WIN: Winner(s) will be chosen at random at the end of each specified contest week. Winner(s) will be announced on Twitter the day after the contest week ends. PRIZING: One book will be given away each specified contest week during the contest period, for a total giveaway of five books within five weeks. 1) Visit us on Facebook or the CMH Blog for further instructions on how to enter. TO WIN: One winner will be chosen at random at the end of the contest period. The winner will be announced on Facebook and the Blog one day after the contest period ends. PRIZING: One book will be given away during the contest period, for a total giveaway of one book within five weeks. * Limited to Continental United States residents (excluding Alaska, Hawaii, and the territory of Puerto Rico). * Must be eighteen (18) years old and over as of the date of entry. * Only one book per winner. * BlogHub Bloggers are eligible to enter. * Giveaway starts Monday May 29, 2017 and ends on Saturday July 1, 2017 at midnight EST or when all prizes are exhausted (whichever comes first). * Each winner will be notified by email, Twitter DM or Facebook and will have 48 hours to respond with their shipping information or a new winner may be chosen. If any Prize or Prize notification is returned as undeliverable, the winner may be disqualified, and an alternate winner may be selected. * Prizes will ship directly after the contest period is over. Please allow up to 2 to 4 weeks for prize delivery.Classic Movie Hub is not responsible for prizes lost or stolen. * Family of Classic Movie Hub are not eligible for entry.